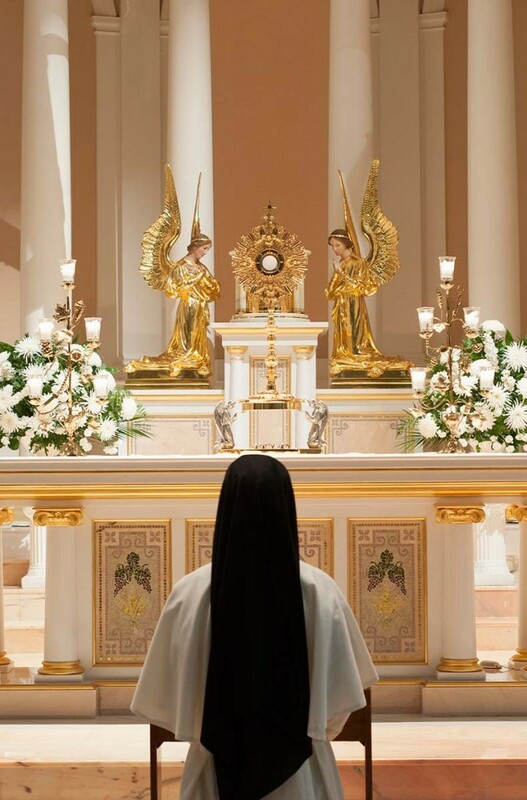 In a community that strives to balance the contemplative and active elements, it is important to acknowledge that in the Dominican Order properly lived, “more souls are saved by contemplative and co-redeeming prayer than by words or action” (Father Philipon, O.P.). As religious, we witness to the fact that it is not what we do, but rather who we are before God that really matters. Those who enter St. Cecilia Convent do so because they are called to religious consecration, and wish to be united to God by vow. While we come with zeal to bring Christ to a world in great need, our primary motive in joining the Order is not to be career educators. The apostolate flows from an active life of prayer, enabling the work that is done to truly be of God. Our apostolic life, then, flows from the solid foundation of contemplation. The chapel is at the heart of our convents, and here our day begins and ends. In our morning meditation and prayers, we let “love anoint us with silence” in order to focus on the Bridegroom of our souls. Offering Him “all our thoughts, words, actions, sufferings and intentions of each day” (Morning Offering), we resolve to do all for his love. In daily contemplative silence, we can more easily enter into the Heart of Christ, laying before Him the needs of the world, and our prayers for one another and for those whom we serve. In this sacred silence, we prepare our hearts to welcome our Spouse at Holy Communion. Throughout the morning this contemplation of Jesus in the Eucharist is continued by our retired sisters, who pray for the Congregation’s work as well as the needs of the world. When the day draws to a close, we return to the embrace of silent contemplation and bring to the Lord those whom we have encountered during the day, thankful to have labored yet another day in his vineyard. The saints show us that any great work has its source precisely in contemplative prayer. “Without me, you can do nothing,” said the Lord. This truth resonates in the life of St. Dominic, who gave his days to men and his nights to God in prayer. As teachers and witnesses of the Gospel, we must first listen in order to become true messengers of hope.